It was very close to the beach and the facilities pretty modern. The beds were firm and comfy. Room very clean and cleaned every day with fresh towels daily. Buffet food at meals quite diverse. Something for everyone. Lunch was especially good. Wine and beer on offer was very palatable too! The Bulgarian dishes were particularly good and there should be more of them! Most of the staff were very nice. Entertainment team created a good vibe but this would ideally be followed in the evening with a disco option for the guests. Overall, we enjoyed our stay. The location is good! Food, excellent! Personal is very kind! I am going to take my time out to say this hotel is absolutely beautiful. It's a excellent location. My family stayed for 5 days, all inclusive very good choice. The hotel is clean and beautiful. The staff are all very friendly and helpful. The food was nice. The pool is great. I would love to go back to this hotel. I think the entertainment should be more diverse. The manager and all staff are great. Definitely recommend anyone to visit this beautiful place. The room was large and on the top floor so we had sea view. The grounds and pool area are well kept. The entertainment team made an effort to put on shows but they were young and the shows lacked quality - they were fun thou. We had all inclusive and we found the food to be ok - at every meal you could find both high quality and low quality food - lots of variety. In our 5 nights stay we had our bed sheets changed once and the room was cleaned every day. Lots of shops and restaurants in the area. The apartments are large and have a great view, being at the top floors.Our apartment had also a huge terrace that was really nice. Bon rapport qualité prix. Personnel sympathique et à votre service. Grande chambre et salle de bain également très grande. Zimmer modern und schick eingerichtet. Zudem sauber. Kostenlose Parkplätze. Personal rundum nett. Essen war für bulgarische Verhältnisse - meine Erwartungen waren erfahrungsgemäß sehr niedrig- in Ordnung. Ich empfehle insbesondere den Salat oder die Live-Gerichte. 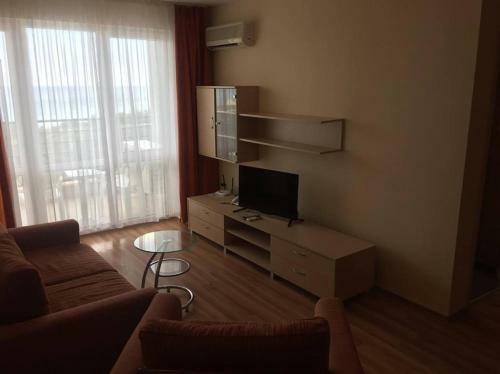 Hotelul este aproape de plaja (5 min de mers pe jos, maxim). Usor accesibil. Nu esti nevoit sa urci pe scari pentru a ajunge la el.Desi a fost construit in 2004, inca arata bine. Personalul este amabil. La check-in, am primit si un upgrade de camera, de la dubla standard, la apartament, gratuit :) Am fost cazati de la ora 12, desi check-in-ul era la 14. Parcarea: desi este mica (15 locuri), am gasit loc. (Mare atentie unde parcati. Se ridica masini intr-o "veselie"). In camera a fost foarte liniste. Nu am auzit musca (camera era in capatul holului). Piscina este mare si curata. Animatorii pentru copii, de asemenea, buni. Multa verdeata in curte. Per total, spre deosebire de alte hoteluri din zona, merita cu siguranta. Un raport calitate pret foarte bun. M-as mai intoarce. Lock in a great price for Odessos Park Apartments (Free Pool & Parking) – rated 8.4 by recent guests! Located 500 feet from the beach in Golden Sands, Odessos Park Apartments (Free Pool & Parking) is surrounded by greenery and centuries-old trees, and features an on-site restaurant. The apartments feature air conditioning and free WiFi. 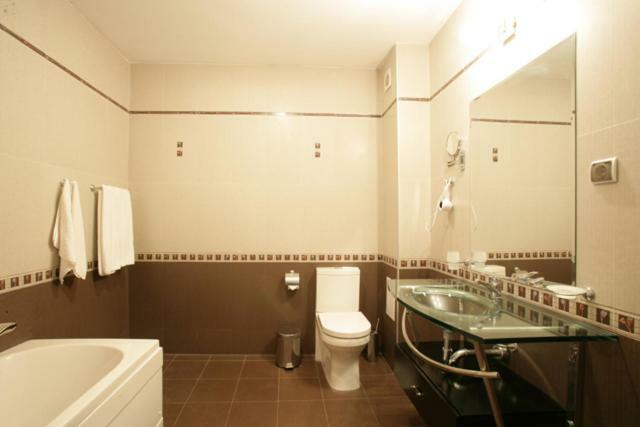 The apartments are individually furnished and feature parquet flooring. All rooms have balconies and cable TV. Guests can relax at the swimming pool of the hotel or on the sandy beaches of the resort. The Odessos Park Apartments (Free Pool & Parking) offers bars, as well as a rich entertainment program and excursions. The on-site restaurant comes with a spacious open-air terrace. Guests can enjoy the show cooking, offered at the restaurant. 뀐 Located in the top-rated area in Golden Sands, this property has an excellent location score of 8.0! When would you like to stay at Odessos Park Apartments (Free Pool & Parking)? Separate bedroom, spacious living-room with kitchen and dining area. Please note that the apartments are equipped with cleaning facilities. Cleaning service can be provided upon charge. This apartment features a view, balcony and kitchenette. Odessos Park Аpartments is one of the most desired places for a relaxing family holiday on Bulgarian Black Sea coast. It is located in a quiet green area, just 200 meters from the beach and 300 meters from the resort center. Our apartments are fresh and comfortable, suitable for couples, friends and families. We offer "room only" accommodation. There is a possibility to pay for breakfast, lunch, dinner or all-inclusive at the hotel. The most important asset of Odessos Park Apartments are our team. We always put the geust satisfaction on the first place. Always working hard and always wearing a smile on their faces, our associates are doing their best to make the guests feel happy. Right behind the corner you will find a lot of souvenir shops, restaurants, bars, and oter entertainments. Just a 5 minute walk and you get to the sandy beach of Golden Sands. House Rules Odessos Park Apartments (Free Pool & Parking) takes special requests – add in the next step! Odessos Park Apartments (Free Pool &amp; Parking) accepts these cards and reserves the right to temporarily hold an amount prior to arrival. Odessos Park Apartments (Free Pool & Parking) accepts these cards and reserves the right to temporarily hold an amount prior to arrival. Please note that the private parking on site has a capacity of 15 lots. Please note that cleaning is provided upon charge. First room we were shown wasn't the type we had booked and lacked a proper sea view. This was remedied pretty smoothly though. Still had to have single beds though instead of the large double bed we booked. Bathroom was okay except the bath was VERY deep and so difficult to clamber safely out of the shower. One tiny shower gel and shampoo for two people for 5 nights not ideal! Housekeeping staff not supplied with items for the rooms so not their fault. Also a kettle but no coffee or tea in room. Breakfast buffet needed real orange juice rather than squash, and butter rather than margarine. Is not a problem, but the sunlight at the pool in the afternoon. The elevators requires an air conditioner. Lots of tourists with lots of kids -if you want something quiet and private this is not the place. You had to walk 5-7 minutes to get to the beach.